Leicester businessman Kulvinder S. Sethi also known to many as Vic Sethi was awarded the title of “Business and Humanitarian Entrepreneur of the Year 2013” award in the British Parliament on the Friday the 25th of October. Vic Sethi was recognised for his family business success along with the contribution he makes to the community globally and his multi-cultural values. 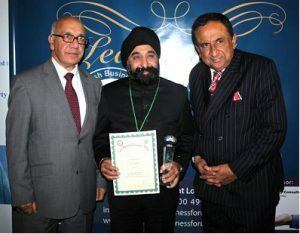 The award was presented by Lord Sheikh to Vic Sethi along with Rt Hon Virendra Sarma. Among the guests present were Lord Karan Bilimoria (the founder and the chairman of the Cobra Beer) and Lord Navnit Dholakia. The Awards ceremony was attended by the members of the House of Commons, members of the House of Lords, Entrepreneurs and many more…. Vic is also currently a chief patron of the charity Crimestopper’s and sits on the national board. He has been on the board of the Prince’s Trust and still is passionate about them and supports them. Vic was also listed in the “Leicester’s Most Influential People” by Leicester Mercury.